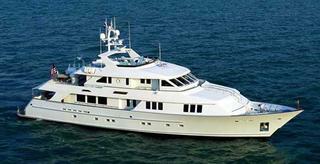 Checking my emails this morning, I find the welcome news from John Todd at Burger Yacht Sales that he represented the buyer in yesterday's sale of Burger's 38.7m motor yacht Sis W, working with listing agent Rex Herbert at Sparkman & Stephens. Sis W is a tri-deck flybridge superyacht built by Burger Boat Company in 2003 with wheelchair access, an elevator and zero speed stabilisers. Her interior, designed by Beldin Interiors, accommodates up to 12 guests in a main deck master with an adjacent twin-bunked ensuite stateroom plus two double and two twin staterooms. Sis W was on the market asking $14.95 million.